AUSTIN --- On Friday, Nov. 19, State Representative Ryan Guillen, D-Starr County, gave an in-depth walk-through of the state legislative process to more than 50 high school students from South and East Texas. The students traveled to the Texas Capitol from high schools in Duval, Starr, Webb, Camp, Upshur, Wood and Harrison Counties to take part in the 7th annual Student Legislative Session. The event, founded by State Reps. Ryan Guillen (District 31) and Bryan Hughes (District 5), provided the students with detailed insight on how the legislative process happens and the common duties of state lawmakers. "It is always gratifying for me to share with students how our state legislature operates," said Rep. Guillen. "Representative Hughes and I were very happy to see students from our districts engage in well thought-out discussion throughout the day. I hope this experience will encourage students to become more involved in their communities, state and nation." Students nominated to attend the event from Starr County included Dayali Garcia (La Grulla H.S. ), Pablo Martinez (La Grulla H.S. ), Eloy Rodriguez (La Grulla H.S. ), Tracy Alaniz (Rio Grande City H.S. ), Maximiliano Magallanes (Rio Grande City H.S. ), Cebrina Cavazos (Roma H.S. ), Valeria Molina (Roma H.S. ), David Barrera (Roma H.S. ), Omar Olivarez (San Isidro H.S. ), Pedro Treviño (San Isidro H.S. ), Daniella Robinson (San Isidro H.S.) and Lisa Saenz (San Isidro H.S.). The students had the opportunity to listen to the inspiring and motivational words of ex-Deputy Texas House Parliamentarian Chris Griesel, ex-Texas House Parliamentarian Denise Davis and Texas Deputy Secretary of State Coby Shorter III during the event. In addition, the students, along with their chaperones, had the chance to take an official tour of the Capitol and participate in a comprehensive mock legislative debate in the Texas Senate Chamber while sitting in the actual seats of Texas state senators. The bills discussed ranged from the topics of higher education to healthcare. The Senate Chamber was used this year due to renovations being made to the Texas House Chamber. Both Rep. Guillen and Hughes say they look forward to hosting next year's Student Legislative Session. "I hope the students learned plenty about Texas government and enjoyed it as much as I did," said Rep. Guillen. * Names of individuals in photograph: (From left to right): Maximiliano Magallanes (Rio Grande City H.S. 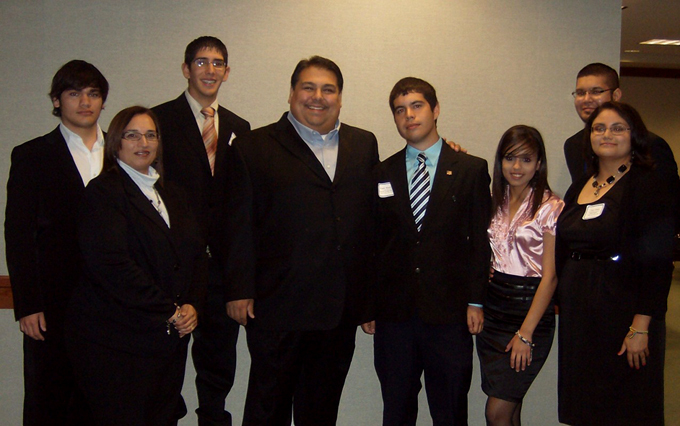 ), Nora Escobedo (Chaperone), Eloy Rodriguez (La Grulla H.S. ), Rep. Ryan Guillen, Pablo Martinez (La Grulla H.S. ), Dayali Garcia (La Grulla H.S. ), Armando Gutierrez (Chaperone), Tracy Alaniz (Rio Grande City H.S.). The photo was taken in the Legislative Conference Center in the Texas Capitol. Morning of Nov. 19.